Lower and intermediate school art is all about igniting the imagination and exploring a variety of supplies and subjects. The theme of the annual Spring Arts Festival in April plays an important role in the theme of art students cre ate throughout the year. As students explore tempera paint, watercolor, oil & chalk pastel, and more, they practice and explore skills that are built upon as they advance through these grade levels. art movements. Students are encouraged to exercise and grow their creative side while enjoying the relaxed atmosphere in the art studio, and experiment with skills and materials. Art opportunities after school are also an option for middle school students. of materials and concepts, cross cultural con nections through analysis of art history, and learning how to build a successful portfolio. 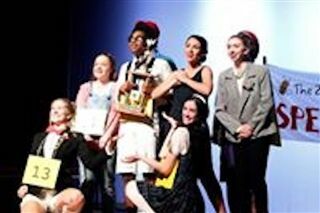 Each year, Brookstone’s theatre department presents four major productions: the fall upper school competition One-Act Play, the fall middle school musical, the winter upper school musical, and the advanced spring play. 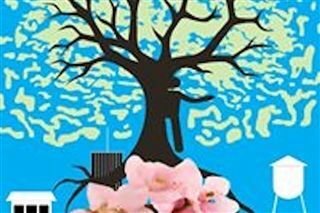 The Final Showcase is a variety show for upper school theatre students and the Spring Arts Festival is a Fine Arts collaborative event for all ages that features all of the art department’s contributions to a cultural topic. the end of the year Curtain Call production. By incorporating the Orff Schulwerk and KoICAL daly approaches for building musicianship through imitation, experimentation, and personal expression, each and every class is filledwith the sound of children engaged in making music! Whether the students are singing, play ing the xylophones, experiencing rhythm on the drums, or getting ready for a class play, joy is in the air! Music education is taken to the next level in the fourth and fifth grades. Students learn to read music through instruction on playing the recorder. They also study famous composers and present a mini-musical to the intermediate and lower school students. The personal responsibility and interdependence that the students learn while preparing for this performance is an integral part of the Brookstone experience. Students in sixth and seventh grade have a unique opportunity at Brookstone to take a combined piano/chorus class. In this class, the students have direct instruction on the piano, presenting a recital at the end of each semester. Daily practice is the key to becoming proficient at any instrument, and that practice time is built into each day. Students also develop their voices as they learn proper techniques for singing and participate in concerts, on and off campus. Eighth through twelfth graders may choose to concentrate solely on their piano skills. Whether a student is just beginning this musical journey or has had many years of lessons, everyone makes astounding progress in the piano lab. Our students at Brookstone are multi-talented! 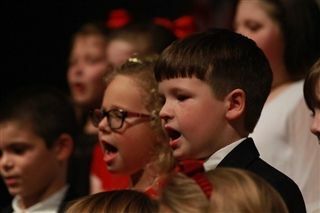 Kindergarten thru twelth grade students are opportunity to particpate in one of our Cougar Chorus programs. Just another avenue to foster a lifelong love of singing. Throughout the year the chorus has many performance opportunities.